If you’ve been writing content for a significant amount of time, you know that consistently identifying high value topics can get very difficult. In fact, once you’ve built up a decently sized content catalog it may feel like you’ve already covered all the ground possible. Combine that with everyone throwing out content, and it can feel impossible to say anything new. However, that very backlog and oversaturation can be remarkably effective in helping you generate unique content that will resonate with readers in your niche. In this article, I’m going to show you how to triangulate your top performing content, popular angles in your niche, and underexplored areas of interest to generate truly unique content. Let’s get started. The first step in this process is identifying which topics already resonate well with your audience. You’ve probably heard that the greatest predictor of future success is past success, and that applies as much to content as anything else. If you are hesitant to cover the same ground that you’ve already touched on in the past, don’t worry too much. Before the end of this process we’ll ensure you’re taking a fresh approach to the topic. In order to determine the topics which resonate best, I’d recommend confirming it based on your goals. For the purposes of this article, let’s say we care most about amplifying our message through social engagement. 1. Log in to Ahrefs and navigate to the content explorer tool. 2. Set the date window you care about. In most cases with content analysis I tend to look at the past year, but in this case I want to look at all the content we’ve posted then manually review the topics and dates. That will give me a good idea of whether the content has consistently appealed to our audience long term. 3. Now enter the URL for your blog or website (or that of your clients) and sort by the metrics that apply to your content goals. In this case we’re sorting by total shares. 4. Now look at your top performing content and group the recurring topics. In this case, you can see that in our top five results we’ve got two articles focused on content promotion, one on outreach tips and another on social data analysis. Once you’ve grouped all of your topics, make note of the top content area that has most consistently appealed to your audience. Once you’ve identified the top performing content for your audience, you need to identify what is currently resonating in that topical niche overall. This will allow you to take the pulse of the current landscape to get a sense of the specific subtopics and points of interest that you should be trying to cover in your new content. There are many tools you can use to discover this, but here’s a simple process you can use in Ahrefs since we’re already hanging out there. 1. Once again, navigate to the Ahrefs content explorer and plug in the topic category that you discovered as being most performant for your audience. This time, you will want to apply some filters to make sure you’re looking at high quality content. 2. Look through the content and identify any specific subtopics that seem to be popular and add them to a list. Sometimes you can grab these straight from the headline, as with this example for “paid content promotion”. Other times, you’ll need to dive into the popular content to find the unique angle. 3. Now, identify a subtopic from your list that you think would resonate with your audience and review the content. What you’re looking for are specific elements of the content that have a lot of potential interest but are briefly explored or largely unanswered. In this case, the mention of Instagram paid content promotion serves the purposes of the article but there is a LOT more you could cover on this topic! 4. Continue doing this until you’ve accumulated enough to get a good idea of the areas of opportunity within your selected subtopic. As I mentioned, this is a simple and direct process. However, it can pick up some results that perform well simply because the sites they are posted on are popular and will get promoted no matter what. If you want a slightly more involved process that will correct for this, I’d recommend you check out Derek Gleason’s guide to adding more context to your content analysis. Now that you understand the resonant subtopics and underexplored areas of interest you’ll need to validate that these are areas that readers are actually interested in. What you’re looking for here are high interest questions that have not been satisfactorily answered. You can find these on the main Q&A sites like Quora or specific subreddits, but BuzzSumo has put together a tool specifically geared towards finding questions and organizing them by topic. 1. Log in to BuzzSumo and navigate to their Question Analyzer. Plug in your specific interest areas. Note: you’re probably going to have to play with the language a little bit until you hit on the wording that gets you a substantial number of results. 2. BuzzSumo will now return a list of questions organized by topic and a word cloud that will highlight the biggest topic categories and let you jump right to the ones that interest you. 3. Now begin exploring the questions around your chosen topic. Pay particular attention to the questions on larger sites (Quora and Reddit) because they will often get more exposure than those on niche forums. 4. Once you find a question that seems applicable, open it up and gather some more info. Ideally, you want a question with lots of interest (follows or upvotes) but very few answers or ones that don’t answer it satisfactorily. That will indicate that this is a hot topic without great info currently – a perfect opportunity for you to dive in. 5. Other opportunities you can look for are questions that have a large number of self-promotional answers. These will often answer the question in a cursory way but drive people to a paid consultation for the real info. If somebody is getting paid for info there’s likely a lot of interest. 6. If others are giving responses to question that seem good but don’t answer it comprehensively, make a note of those as well. You can expand on them in your piece. Also, you can reference the original response for a great opportunity to build a relationship. At this point you’ve got a list of specific topics that you know are highly in demand and will resonate with your audience and your vertical once you hit that publish button. The last step to determining which of these is the best fit (or which you should prioritize first) is to figure out where you can add unique value. When you create content that is genuinely hard for others to replicate you have a greater chance for it to spread due to its originality and it will appeal more to high authority sites. It also creates a competitive advantage for your content because no one will be able to swoop in and create something that is 10x better without major effort. In any case, carefully review your list and note where you’ve got the opportunity to add unique expertise. Don’t skimp on this step. It’s worth engaging with other teams in your organization or reaching out to influencers to get a sense of true competitive advantage opportunities. At this point you’ve got all the pieces in place, so get out there and write! The good news is, given the way that this process uncovers highly unique opportunities that aren’t unanswered, you can utilize it again and again to fill out your editorial calendar. If you decide to use this process, I’d love to hear from you. Do you have other ways you’re creating fresh content? The post Content Research Strategy: Finding Unique Topics In an Oversaturated Niche appeared first on BuzzStream. As long as I’ve been doing SEO and digital marketing, I’ve pushed for the early adoption of new products, platforms, and technology. The 22 Immutable Laws of Marketing (not an Amazon affiliate link, I swear!) has been a book I’ve leaned on since studying marketing in college. To me, this concept doesn’t speak for product marketing alone. Google is processing tens of thousands of search queries each second. But they are bigger than their standalone search engine. This makes any peripheral plugging into its search engine an incredible marketing and branding platform. The more search results referencing a company, the more that company becomes recognized to searchers. So why shouldn’t SEOs be helping companies be first to take advantage of a new technology? Why shouldn’t SEOs be optimizing for voice search results? After all, “being first” is our thing. Granted, some of the new features, technology, and platforms I’ve pushed to clients throughout the years didn’t pan out. For every AMP there’s an Authorship. For every Freebase, there’s a Google+ (sick burn!). It’s common for a modern SEO to suggest using Progressive Web Apps, VR and AR applications (i.e. Amazon Sumerian). If a technology has the potential to improve a searcher’s experience outside the traditional search engine model, build loyalty to the brand, and enhance conversions, it falls into the purview of SEO. After all, rankings in SERPs aren’t all we should be thinking about these days. We should be thinking about reaching the right searcher, understanding their intent, and giving them the experience they want and need (sometimes these are two separate things). We should be thinking about helping searchers, businesses, and Google at the same time. A win-win-win. To me, everything above has been the natural evolution of SEO to date. Voice Search is not new, but the role of voice search in everyday computing is growing at an incredible pace. “Voice-first” is showing up in more technology, from stereos to electric outlets. It is most popularized by titans like Google, Apple’s Siri, and the Amazon Alexa. Not to be left behind, Voice Search is Google’s latest shiny object. It is part of mobile search, mobile devices, and digital assistants. It works for online and local businesses (i.e. local SEO) alike. Compared to Google’s pushing AMP in 2017, this year has shown a real obsession with Voice Search. Google I/O (in May 2018) introduced projects around AI and “continued conversations”. We learned that Google is still pushing for smart displays in their voice assistants. These will provide more opportunities for users to ask algorithms for things. These wild speculations are partly because we aren’t receiving any Voice Search metrics from any of the Voice Search providers (though this may change one day), so we’re in a state of ¯\_(ツ)_/¯ at the moment. Despite knowing the search algorithm processes these voice queries. Want some more juicy stats, speculation, and opinions? Google says 72% of people who own a voice-activated speaker say that their devices are often used as part of their daily routine. 55% of 13-18 year olds use voice search every day. Google says voice-activated speaker owners would like brands to give them information about deals, personalized tips, upcoming event information, options to find businesses in the real world, and access to customer support. 42% of a surveyed group says voice-activated devices have quickly become “essential” to their lives. How much of this is representative of real life? Clearly, the truth lies somewhere in the fuzzy middle. The first question a business asks is whether it’s worth the investment to play in the fuzzy middle. As I referenced the Immutable Laws of Marketing above, my answer would be yes. But I recognize it’s one thing to stand on my pedestal and spend a company’s money for them, where the failure isn’t necessarily a financial pain I would feel. I also recognize that most SEO campaigns need to have a business case, and the “fuzzy middle” doesn’t lead to convincing anyone of a real opportunity. So my argument for the investment? SEO is changing again. There isn’t a company out there who doesn’t know what SEO is, and very few who think it has no value. SEO as a marketing channel has already been sold through. So we are not talking about selling SEO here; instead, we’re talking about investing in the next wave. From my perspective, I see many articles written about Voice Search, and the occasional conference talk, but I don’t know many SEOs or companies who are embracing it as an opportunity. Now, returning to an earlier statement: SEO is not just about rankings. It’s no longer just about getting people to click the little blue links on Google.com. It’s not just about earning a featured snippet. It’s about helping all of Google’s user base across all their platforms. We’re talking Chrome, your phone’s Google Assistant, your Google Home and Mini devices (also powered by Google Assistant). It’s even bigger than Google – the spirit of SEO lives in app stores, Amazon, Apple (Siri), Microsoft (Cortana), Youtube, and elsewhere, but I digress. That shout-out, I argue, is SEO in 2018. There’s no recorded click. There’s no record of anyone hearing that answer (yet). But Livestrong was promoted in my wife’s mind. And so were the products Google suggested. Winning the featured answer is a start, and SEOs have been studying the techniques for a couple years now. But what about the queries that are more voice-based than text-based? It’s a new type of keyword research. It doesn’t stop there – the skills need to be tweaked for these voice search queries. In this Martech Today article, they called it “voice query design,” as a component of “Voice Interface Optimization.” I’ve heard other terms like “conversational UI” and “conversation design”. Some new terms here, and we’ll see which ultimately stick. Labels aside, the technology shows nothing but signs of sticking. Who better to help optimize this system than an SEO? This is our bread and butter! As more controls are given to marketers to control the answers Google and Amazon’s Alexa give, the more a brand can control their influence. If you’ve been optimizing for semantic search, you’ve probably already started voice search optimization. If you have followed me in the past, I was quick to jump on leveraging Google’s epochal Hummingbird changes. I wrote this and this in 2014 on the heels of Hummingbird. When the dust settled, we SEOs realized what Google was trying to do. Google realized they needed to take reliance away from keywords alone, and add a new skill – comprehension. From search entities and the relationships between concepts, Google certainly got smarter within the semantic search model. Instead of thinking of queries as choppy, fragmented keywords, I began expecting more natural-language queries typed into the Google search bar. With that in mind, it drastically changed how I optimized copy. I was no longer just trying to optimize for a keyword – I was trying to optimize for a theme, and hit upon the concepts and relationships I assumed Google had in their knowledge graph. Remember, at the same time, Hummingbird also brought us huge improvements in conversational search. More of a reason to consider optimization outside of the choppy approach we were used to. I was trying to match the way I predicted people would be seeking their information. The intent of the searcher and the inherent value of my content became paramount. So much so, I haven’t done nearly as much keyword research as I used to. Gone are my massive lists of keywords and estimated search volume metrics. These days my lists are much, much smaller. SEOs, we have our work cut out for us. We have much to learn as Google keeps growing the abilities of their voice processors, and we should be currently experimenting with this new technology now. We need to stop watching all the headlines pass by our news feeds (which are the same headlines businesses are seeing), and jump in, grab the bull by the horns, and own this for our clients and bosses. There’s money to be made, but SEOs need to evolve. Think about the company you represent. What are they experts in? What do they do better than any other? If the answer is “nothing,” let me rephrase: What could your company be experts in for voice searchers before your competitors step up to the plate? (Remember the first Immutable Law of Marketing). With these strengths in mind, it’s important to think about the direct goal that voice search can answer. I suspect with this new technology, there are some impatient and frustrated users who have had their fill of “Sorry, I can’t help you with that right now, but I’m always learning.” Yes, Google is in the early stages – their new child is still a baby, so it makes sense to feed this technology at its level. Build direct answers that can answer direct and popular queries. Additionally, build content that can answer all the anticipated questions in a series of spoken questions. Traditional keyword research now has to consider such nuances. Are we providing content in a way that not only clearly answers the needs, but also illustrates the content’s importance to Google; thus, improving Google’s growing comprehension? If I want Google to read my content out loud, or serve up a web page on my phone, I better make my content considerable for Google. To do this, I need direct and helpful content passages instead of long, redundant, over-optimized text. This makes for an easier read anyway. Frankly, this is taking a page out of the content strategists’ playbook, and the mindset they have about web content and the inevitability of voice search. In the end, SEO done right is a win for everybody. Now is the time to include a voice search optimization into your SEO strategy. I was alerted about this cool tool from Synup that helps you see how ready your business is for voice results: Voice Readiness Test. The post How To Optimize For Voice Search: The SEO’s Journey (So Far) appeared first on Greenlane. HUGE NEW UPDATE! If you don’t have time to read this post terminate your Majestic account immediately and take out the Ahrefs trial without hesitation. Back in 2013, I conducted an experiment to see which is the best backlink checker. So then re-conducted the experiment on an altogether BIGGER scale (1 million domains vs. the original 3). Ahrefs won again. Now it’s 5 years later. So I thought it would make sense to re-run the numbers this year for all 1 million domains AND compare the functionality of the tools. Before we get to the experiment, let me talk about my data source. For those that don’t know, the Majestic team publish what is called the Majestic Million. The Majestic Million is a list of the top 1 million website in the world, based on the number of referring IP’s found for that domain in their Fresh index. So with this, Majestic SEO are outright telling us these are the sites they know the most about in terms of backlinks. You can download a copy for yourself free of charge and it will tell you the total number of linking subnets (RefSubNets) and the total number of linking IPs (RefIPs) for each domain in the top million. To compare Majestic SEO with Ahrefs, I’m going to look up the total number of linking subnets and IP’s for all of the domains in the Majestic Million. So in that specific instance, Majestic wins the test. Now imagine doing the same – but for 1 million sites. That is the test I have done based on what Majestic say are the top 1 million sites in the world in terms of links. And you can download a copy of the data that is used in this test. Before I get to the results, I need to mention that both Majestic and Ahrefs maintain multiple indexes. Majestic have two indexes: Fresh and Historic indexes. Ahrefs have three: Live, Recent, and Historical. You can learn more about these indexes here. Let’s start with a comparison of the Fresh vs. Recent index. With such a huge amount of data, I decided to split the results into 10 groups of 100,000 URLs (by Majestic GlobalRank) and then compare those groups. Just looks like a bunch of meaningless numbers right? Pretty brutal to look at if you are a current Majestic SEO customer right? Now might be the right time to switch to Ahrefs – click here to claim a 7-day trial account. It’s worth noting that Ahrefs has actually pulled even further ahead of Majestic (by ~7% for IP wins, and ~11% for subnet wins) since 2013. Which is when I first ran this experiment. 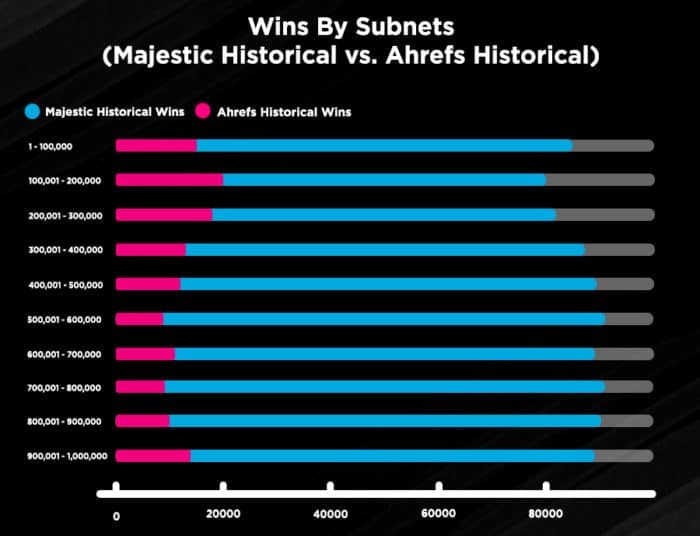 So those are the results of the Majestic Fresh vs. Ahrefs Recent index comparison, but what about Majestic’s Historic vs. Ahrefs’ Historical? It presents an altogether different story. Based on this data, Majestic absolutely crush Ahrefs when it comes to the historical index test. So, Majestic clearly wins the historic index comparison. Well, historic indexes serve as records of the backlinks that have existed in their respective tools index at some point in the past, but aren’t live today. When you take this into account, it comes as no surprise that Majestic won this test. They’ve been saving (probably) links to their Historic index since they launched in 2009. Ahrefs, on the other hand, has only been saving dead links to their Historical index since 2015, so Majestic has a 6 year head start here! Bottomline: Majestic has a larger index of dead links than Ahrefs. That’s all I’m going to say about that one. I’ll let you decide which index is more important to you. My methodology for this experiment is far from perfect. So I thought I’d briefly explain what I see as some potential flaws with this data. The graphs above show the number of “wins” rather than absolute numbers. Because of this, the difference between the bars on the graphs is not really indicative of index size. Ahrefs “wins” for both of these sites, but it’s clear that there’s a much larger difference between reported numbers from each tool for Site B. With Site A, Ahrefs only wins because they report one extra Ref.IP. This means that the “number of wins” doesn’t give any insight into how much bigger one database is than the other. So what does “number of wins” tell us? It tells us that Ahrefs finds more links for any given website than Majestic, and that it’s rare for Majestic to show links than Ahrefs (links = IPs/Subnets). FYI, if you’re wondering why I chose to compare IPs/Subnets over links, check out this article co-authored by Dixon Jones from Majestic. It’s important to remember that we’re dealing with two totally different indexes here. Which means that some links that Majestic reports may not exist in Ahrefs’ Index, and vice-versa. Once again, let me offer an example. This time we only need one hypothetical site, for which we’ll assume that both Ahrefs and Majestic report the same number of links: 3. Just because we have the same number of reported links from each tool doesn’t necessarily mean that they’re the same links. You can see in our hypothetical example that only two of the links are common to both indexes. If you desperately need a full picture of your link profile, you’ll have to pay for both tools and cross-reference data. Even if you do that you need to understand that Majestic’s backlink stats are almost always inflated. Because of the absolutely absurd way Majestic count and report backlinks. I am going to talk about that more in the next section, but seriously – make sure you are sitting down for this one because I am going to show you how Majestic essentially cheats on backlink counts. Majestic and Ahrefs are VERY different tools. Majestic is essentially one tool: a backlink checker. Another big differentiator is the addition of “Competitive intelligence” in Ahrefs, which is basically search traffic data. In other words, you can see how much traffic any domain or website receives from Google, and the keywords it ranks for. See my full review of Ahrefs here. It’s important to realise that index size means nothing unless you’re able to extract actionable data and insights from it. Both Majestic and Ahrefs do have an API for doing this at scale (this is what I used for this study), but most of us don’t pay for access to that. So, let’s quickly compare the on-site backlink research features that exist in Ahrefs and Majestic. Let’s start by plugging this same URL (the beginners guide to SEO from Moz) into both tools to see what kind of insights we can get from them. NOTE. I’m using the “exact URL” setting, because I only want to analyze backlinks pointing directly at that URL. So Majestic reports more backlinks in total, but Ahrefs reports (a lot) more referring domains. That’s a win for Majestic, right? Majestic’s backlink stats are almost always inflated because of the absolutely absurd way they report backlinks. Let me illustrate by going to the Referring Domains tab in Majestic. Majestic is reporting 370K+ backlinks from just one referring domain. That accounts for nearly 60% of all reported backlinks! So why does Majestic report 373,004 backlinks from that domain while Ahrefs only reports 4? This happens because Majestic fail to strip URL parameters from URLs, which results in the same backlink being duplicated hundreds, sometimes even thousands of times. This also happens when you export the data from Majestic. But the reality is they are just one backlink – but Majestic is reporting them as 4. In my opinion, this is total madness. Especially when the vast majority of the 700,000 links coming from digitalphillipines.net are duplicates. Because Ahrefs understands that those additional URL parameters do not make them all unique links so filter them out accordingly. If you go from the Summary page in Majestic to their Ref.Domains and Backlinks reports, you’ll notice that the total numbers of ref.domains and backlinks that you just saw on that “Summary” page now completely disappear. That’s because these reports are limited to 30k rows of data – 600 pages, 50 results per page. This makes every report in Majestic somewhat useless because you can only see a sample of the data! Sure you can view the first 30,000 rows – but after that, they cut you off. That is a huge limitation and I feel like it really goes against the grain of Majestic’s core mission. What’s the point of building a huge database of links if you are going to limit access to it? It’s the same when you try to export this data too – it defaults to a max of 30K rows. But even when you click this, you’re taken to quite a puzzling page where you seemingly have to tick a bunch of boxes in order to do what you want to do. In comparison, Ahrefs shows full data in both their Ref.Domains and Backlinks reports. And exporting FULL DATA is super easy – just hit the “export” button. However, one downside of this is that reports sometimes load slower in Ahrefs than Majestic, especially when analysing big sites. This is because Ahrefs has to work to pull all data, whereas Majestic just has to show a cached sample of 30K pages/ref.domains. Any further comparison here makes no sense because Majestic’s on-site tools only works with a sample of data whereas Ahrefs lets you work with FULL data. However, I do want to compare and highlight a few things in these reports. But first, I want to talk a bit about indexes. Majestic Indexes vs Ahrefs Indexes – What Do They Mean? So you may have noticed that Majestic has two different indexes for you to choose from, while Ahrefs has three. You may have noticed in the screenshots above that Majestic defaults to their Fresh index, whereas Ahrefs defaults to their Live index. Let me try to explain the deal with all of these indexes. So Ahrefs Live index is updated every 15 minutes, and I know they put a lot of effort into re-crawling all links in their Live index pretty regularly. But as Ahrefs recrawls links, they naturally come across some that are no longer there. Like, sometimes the page will still be live, but the link will be gone. Or maybe the actual linking page can no longer be found. In this case, Ahrefs removes the link from their Live index, but it remains in their Recent index, where this backlink stays for 90 more days. Quite often the pages disappear because of server downtime, so when Ahrefs next re-crawls the page, they may see that the link is still there. If this happens, it gets moved back to the Live index. If Ahrefs don’t see the link going live again within 90 days of it being moved to the Recent Index, it gets moved to the Historical index. This is basically a graveyard for all backlinks that they’ve once seen as live, but the subsequent recrawls confirmed their death. Unlike Ahrefs, they don’t maintain a Live index. They only have their Fresh index, which is kind of the same as Ahrefs’ Recent index as it contains all links that were seen live in the last 90 days, regardless of their status at the present moment. They also have their Historic Index, which is comparable to Ahrefs Historical index. However, it is vastly bigger than Ahrefs’ Historic index because they started saving deleted links years before Ahrefs did. Having used both tools on and off for a good few years, I know that Ahrefs only started adding links to their Historic index around mid-2015, whereas I’d say Majestic has been doing that for at least 5 years. That’s exactly why Majestic’s is bigger right now. Either way, these tools historic indexes are essentially graveyard of links, so most of the links in both Majestic and Ahrefs Historic indexes are no longer live. But anyway, now we’ve tackled the technicalities, I can move on to some features. I much prefer Ahrefs over Majestic. So most of the stuff I discuss below will be reasons why that is the case. But let’s start with a brief comparison of the summary/overview reports in Ahrefs and Majestic. To start, I’ll highlight a couple of super useful graphs that I absolutely love on the Overview tab in Ahrefs Site Explorer: Referring Domains and Organic Traffic. These show how the number of referring domains and amount of organic traffic has changed to a site (or URL) over time. Unfortunately, Majestic have no such graph for backlink data, and they don’t have any data on search traffic at all. They do show you two graphs that they call “URL backlink history” and “Referring domains” – but these are entirely different. So this graph mostly refers to how fast Majestic crawls the web, rather than showing how fast your target acquired backlinks. As a result, these graphs don’t tell you anything about how a target’s backlink profile has changed over time, so I don’t really understand why they’re useful. If anyone does happen to have a good use case, feel free to let me know in the comments! And it’s also an image, it’s not an interactive graph. So I can’t hover my mouse over a specific date and get the precise number, like I can in Ahrefs. As for the other numbers that you can see in Ahrefs “Overview” report and in Majestic “Summary” report, they’re more or less comparable. Pretty standard stuff, no striking differences there. I’d say the only major difference is the fact that each tool shows their proprietary metrics. In Majestic’s case, these are TF/CF. And in Ahrefs these are UR/DR. Comparing them is a different story, so I’m not even going to attempt that but I do use both sets of metrics to evaluate expired domains. Let’s move on to the referring domains reports. Majestic has quite a few data points in their Ref.domains report, so they had to introduce a few different views. Here’s the one they default to: Links. I think it’s really cool how they include the number of ref.domains and backlinks to each ref.domain – that’s something Ahrefs doesn’t do. I also like their Geo report. This shows things like the domain language(s), TLD, IP, IP location (cool! ), TF/CF. In fact, a lot of these reports are quite cool – I recommend playing around with them. But what about filtering and sorting options? Unfortunately, these don’t really exist (I guess their different reports kind of count of filters?) but they do have “Order by” and “Then” sorting options, which are quite confusing. I think the biggest letdown here is that many of these reports end up being kind of pointless, simply due to the fact that Majestic only lets you work with sample data. Sure, you have 30K rows to play with, which admittedly is plenty for most sites. But for some sites it just doesn’t cut it. Although Majestic have a column with a number showing the number backlinks, they don’t differentiate between dofollow and nofollow links. This means it’s only possible to sort by the number of backlinks from a ref.domain – you can’t sort by the referring domains with the most dofollow backlinks, for example. Ahrefs, on the other hand, absolutely shines when it comes to filtering and sorting. For a start, there’s a column highlighting dofollow/nofollow links, and it’s easy to sort a list of referring domains by that metric. And once again, Ahrefs will sort the entire list of ref.domains – not just a sample of the data like in Majestic. You can easily filter referring domains by the backlink type, and can instantly see how many referring domains of each type there is. So if you want to export dofollow ref.domains only, simply filter and click export. Easy as that. Back to Majestic, it looks like the domain with the most backlinks to this Moz guide is ryangum.com. It has almost 378K backlinks. Let’s click on that number and see what they are. Aaaannnndddd… I see only 10. It’s a completely different story in Ahrefs, as they show everything – it’s even downloadable. And again, I’ll reiterate the point I touched on earlier – some of the backlink numbers are absolutely crazy in Majestic thanks to the duplicated backlinks with URL parameters. But anyway… let’s move on. In the Ref.domains report, there was at least some sorting options – here there are none. All they give you is option to show/hide deleted links and display 1/3/10/all backlinks per domain. I can see how one backlink per domain is useful, but three and ten… c’mon! It almost feels like someone was desperate to come up with some kind of useful functionality here, but failed miserably. Regardless, none of these restrictions matter anyway because this report (like the rest) only shows a sample of 30k rows out of almost 100k. That means Majestic are hiding 70% of the links they know about from you. Luckily, things are more logical in Ahrefs. First things first, their Backlinks report doesn’t show sampled data – it’s full data. You can also choose to show either Similar links, One link per domain, or All links. This report defaults to Group similar links. This makes sense, as it groups sitewide and duplicated links, but still shows unique links from unique pages of the same domain. Which is pretty cool. Is this report perfect? No. I’ve seen a few bugs here and there, but the usability and convenience of this filter still beats Majestic’s useless “3/10 links per domain” filter by a wide margin. You probably already spotted those other filters too – Link type, Platform, and Language. I recommend playing around with these – they’re really cool! Combining sorting AND filtering is when you really start to do some cool stuff. For example, you could filter by dofollow links only, from English sites only, and then sort by DR. Seriously, play around this this report – you can do TONS. Ahrefs is MUCH MORE than just a backlink checking tool. They have world-class search traffic data too. Yes, there are other tools have one of the two (e.g., Majestic with their backlink data) but Ahrefs does an amazing job of merging backlink and search traffic data together. I don’t think there’s a better example of this than in their Top Pages report. This shows the “top pages” on a domain by search traffic. There’s also a keywords dropdown which unveils ALL the keywords each page is ranking for. Majestic has nothing like this, so there’s nothing to compare here. Where Else Do These Tools Shine? I mentioned earlier that Ahrefs is much more than a backlink checking tool. It’s actually a suite of SEO tools. Content Explorer is one tool I want to highlight here – this is a database of almost a billion web pages complete with backlinks and traffic data. Basically, you enter a keyword and it’ll return any content containing (in either the title or body of the article, depending on your selection). The highlighted region shows some of the cool data that Content Explorer shows for each and every results – there’s Domain Rating, referring domains, and organic traffic. I’m not aware of any other tool that can do this and honestly, it’s super-useful! And let’s not forget the “who tweeted” button which is useful for any content marketers out there. But what about Majestic? Where does that shine? Well there are some cool things that I like, such as their Trust Flow and Citation Flow metrics. If you’ve read my guide to finding expired domains, you’ll already know that I look at a ratio of these two metrics to find decent domains. I’m also a fan of Majestic’s Topical Trust Flow metric, which is super useful for getting a sense of how relevant a backlink profile is. However, I’ve found that this isn’t always particularly accurate. You can see in the screenshot above that mythemeshop.com (a website selling premium WordPress themes including my theme) falls into the ‘Health’ category when looking at Topical Trust Flow. So as you can see, the tool that’s most useful for you will depend on the kind of data that you’re trying to access. For me, Ahrefs is my go-to tool for almost everything these days. I’d say Majestic does maybe 10-20% of what Ahrefs does, and that’s being generous! Irrespective of opinion, bias and discreditation – the data does not lie. The data never lies, its why I love working with data so much. Want to settle which design is better? Test it. Want to see which is the best backlink checker? Test it. Ahrefs is clearly the winner here by a huge margin – a much larger margin than my initial test with just 3 domains highlighted. 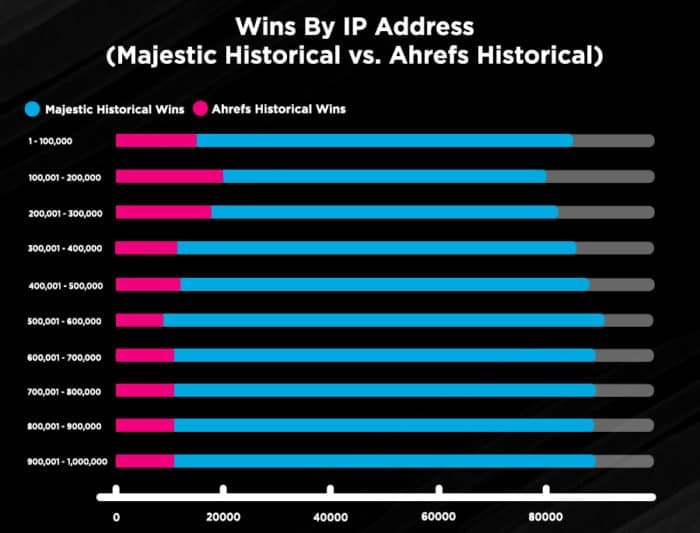 In the Wins by IP test, Ahrefs finds 216% more than Majestic SEO. They are winning on ~76% of domains compared to Majestic SEO’s ~24%. In the Wins by Subnets test, Ahrefs is also the clear winner finding 306% more links than Majestic SEO. They are winning on ~80% of domains compared to Majestic SEO’s ~20%. So quite clearly, the best backlink checker is Ahrefs. PERIOD. Even if the source data is Majestic SEO’s very own Majestic Million – Ahrefs still knows more about them than Majestic does. Unless you only care about who has the biggest database of dead links of course. And let’s not forget about all of the other awesome tools Ahrefs has – it is so much more than a backlink checker. In an effort to be unbiased and transparent, I have 2 seperate ways for you to independently verify the data yourself. All of the data used in this test is available to download here. This is the easiest way to spot check the data. You can manually spot check these at random! What if you want to verify the data for all million domains though? Well for that you will need a linux server with shell access, an Ahrefs API key and these files. WARNING: Before you do this be aware that 1,000,000 API credits with Ahrefs costs $10,000. For full transparency’s sake Ahrefs gave me an API key with 1,000,000 credits so I could run this test. If any established bloggers want to confirm these results themselves and publish on their blog then please get in touch with me. Remember folks regardless of all of the controversy the data does not lie. And if you haven’t checked out Ahrefs for a while you might be surprised, because it has evolved from a simple backlink checker to a complete SEO tool. You can sign up for a free Ahrefs account here to check it out for yourself. Next time you see this topic in a forum – feel free to use this post to instantly win the argument.